We are parked this evening at Orange Grove, once again picking oranges to brighten winter days at home. I am watching the big rigs roll in, up to 4 and 6 at a time, and once again the park is completely full tonight. 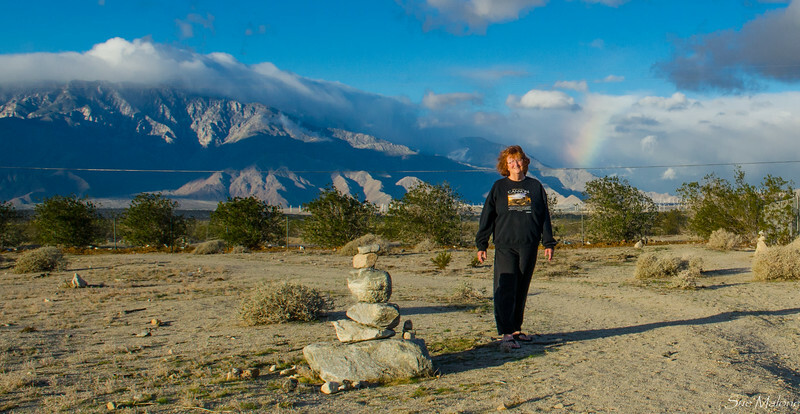 It is such an easy stop, after the long drive down the slopes of Tehachapi Pass. Level pull-through sites, full hookups, nice people to check you in, quick and easy, and yes, the oranges. It is always about the oranges. Leaving the Coachella Valley today was bittersweet. It was perhaps the most blue sky day since we arrived, with temperatures predicted to be in the mid 60’s. There wasn’t a cloud in the sky when I slipped into the pool at 6am to swim through the sunrise lighting up a few small, low clouds in the east and turning the snows on Mt San Jacinto to the west a brilliant pink. With a short goodbye to new friend Claudia, we were on the road a little after 9am, enjoying the gorgeous light. 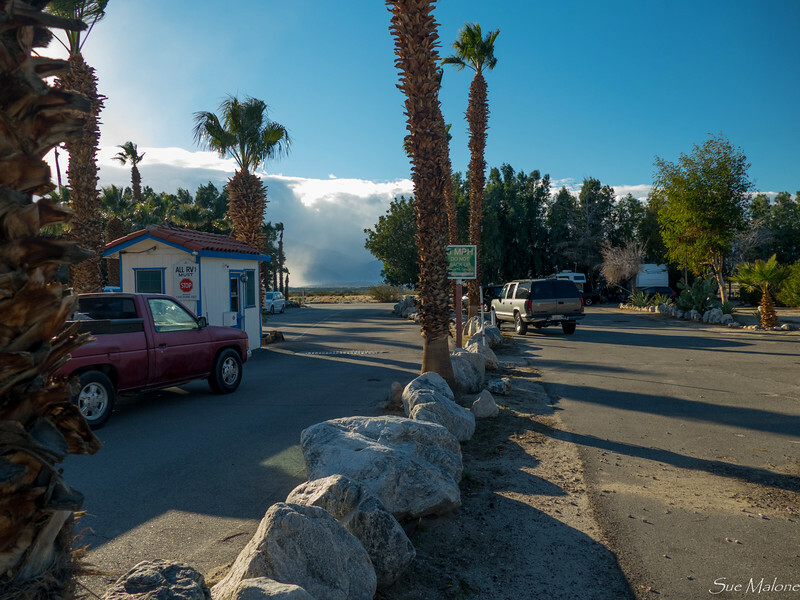 We decided again to take the slightly longer and a little bit slower route through Yucca Valley, north on Highway 247 to Barstow, before intersecting I-40 West. As we drove through the wide open desert, through what Mo called “A whole lotta nothing”, I basked in that whole lotta nothing. It is why we love the desert, and this last nostalgic drive north on 247 is a fitting leave-taking of Southern California. We are timing the trip north to slip between storms, with good forecasts for the next two days as we travel home to Grants Pass. We also decided to try something different this time, and we will take the old route 99 toward Lodi instead of the wide and incredibly bumpy Interstate 5. I’ll let you know how that goes. The title of this blog post is also the title of a great little book that I found at the Indian Canyons visitor center a few days ago when we hiked Palm Canyon. 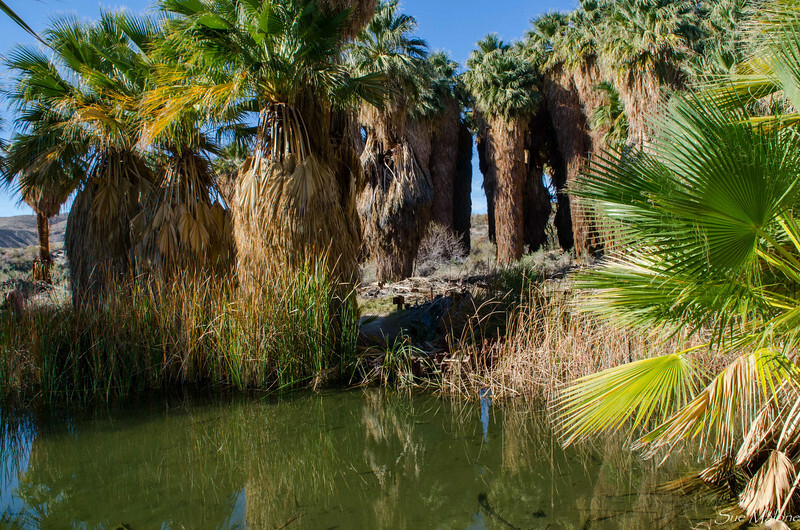 Wonders of the Coachella Valley, by James W. Cornett, is a lovely small guide to ten of the best natural places to visit in the area. After 7 annual visits to this area, we are still finding new places to explore. Finally, after our hike yesterday, we have been to all ten written about in this great book about some of the local natural history. 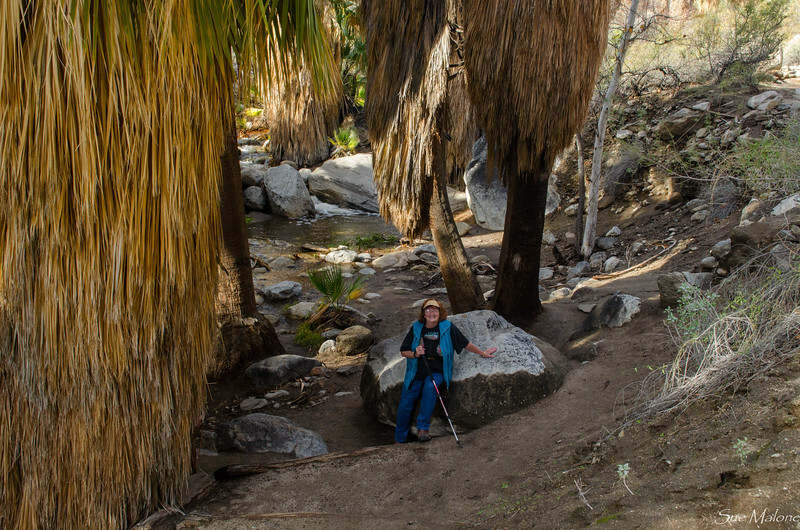 Taquitz Canyon is one more treasure, another beautiful canyon at the edge of Palm Springs. 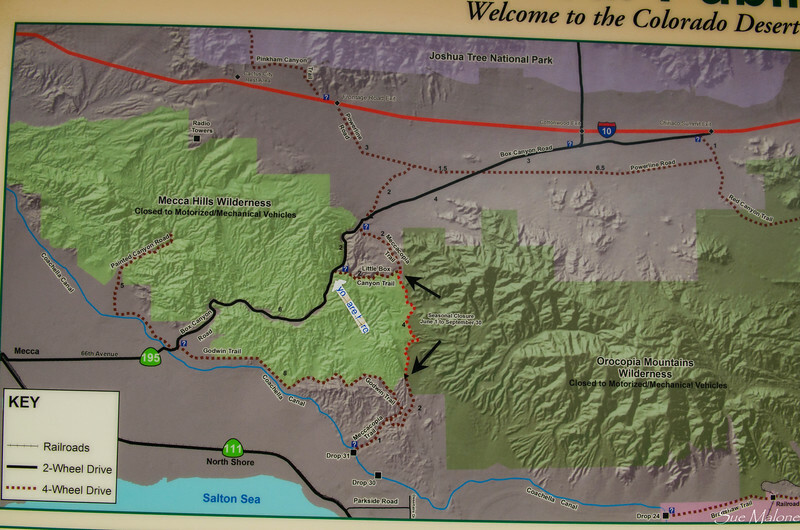 It is owned by the Aqua Caliente Band of the Cahuilla Indians, as are the Indian Canyons we visited previously. This canyon, however, has a separate visitor center and a separate entrance. The cost to hike the 2 mile trail is $12.50 per person and worth every penny. There are no senior discounts, but it is free to folks with a military ID, either active or retired. 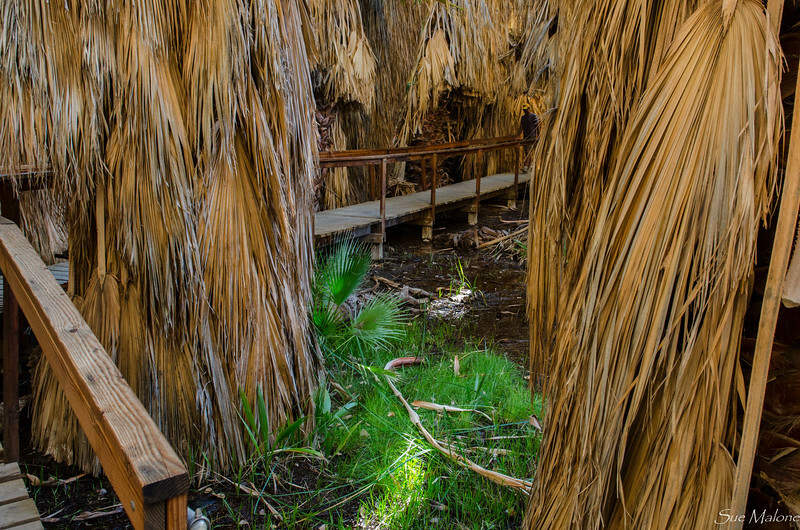 The history of the canyon goes back at least 2,000 years, with evidence of humans occupying the area at that time, traveling to the Ancient Lake Cahuilla for fish, and building materials for their homes, and returning to the lands near the canyon for other plant and animal food sources. Included with the entrance fee is the opportunity to view the short film about the legend of Taquitz, and the reason that no Native Americans have chosen to live within the canyon itself. More recent history of the canyon is interesting, with hippies living in caves during the 60’s, and vagrants and trespassers ignoring the no trespassing signs. Even though it belonged to the tribe, they didn’t have the resources to maintain the trails and keep out the vagrants. We read several newspaper articles displayed from the last few decades that document the problems in the canyon, and the eventual successful restoration of this magical place. The tribal people have cleaned it up, kept it clean and free of scary squatters, and allow us to walk the beautifully maintained trails to one of the loveliest waterfalls I have seen in this part of the world. 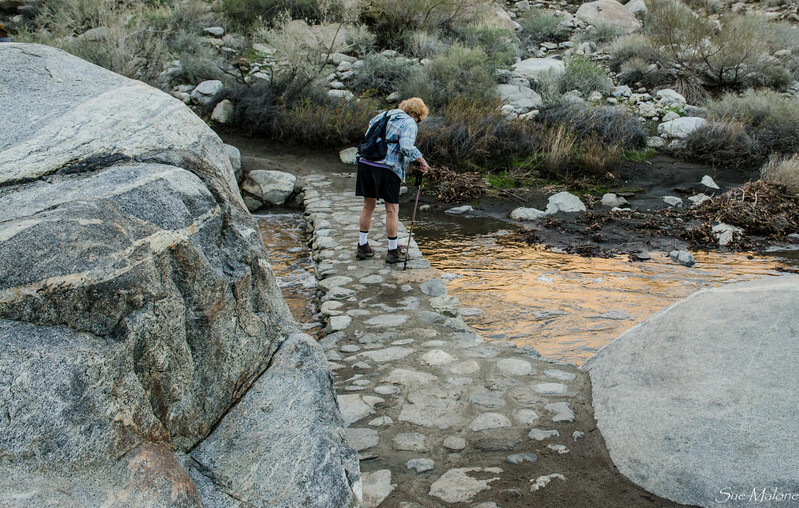 There are lots of stone steps leading up the canyon, and the small stone bridges crossing the active creek are works of art. I love a loop trail, and this one follows both sides of the creek to the falls, so there are options to go in either direction. I think we picked the best, staying toward the right as we left the visitor center. I don’t mind climbing up all the steps, with a knee that likes ups much more than downs, and I think there were fewer steps on the other side of the creek on our route downhill. Even on a sunny Saturday around 11 there weren’t so many people on the trail that it was uncomfortable. It is a hike that can be completed by just about anyone willing to climb the steps and we saw families with kids, runners in bright shoes, and old people with walking sticks enjoying the trail. The falls is enclosed in shadow, and judging from the high walls surrounding the cascade, I would imagine that the sun never shines in that alcove. The sound was beautiful, but even with only a few people on the trail, it felt as though it would be hogging the scene to hang around too long. Everyone wanted their photo right in front of the falls, and it was only fair to take turns. 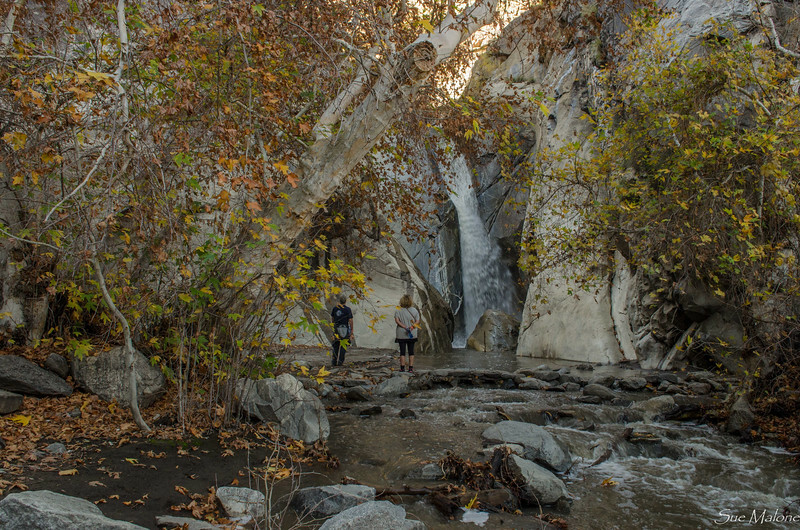 With the dark shadows and dim light it was difficult to capture the beauty of the white bark of the huge old sycamores that thrive in the moist soils of the canyon floor and at the base of the falls. With the brilliant yellow brittlebush that covers the hillsides not yet blooming, our only spot of color was Justica californica, Chuparosa, with a salvia type flower that was brilliant red. Chuparosa is a colloquial Spanish word for hummingbird bush, and I did see a hummingbird hanging around in the lower part of the canyon. 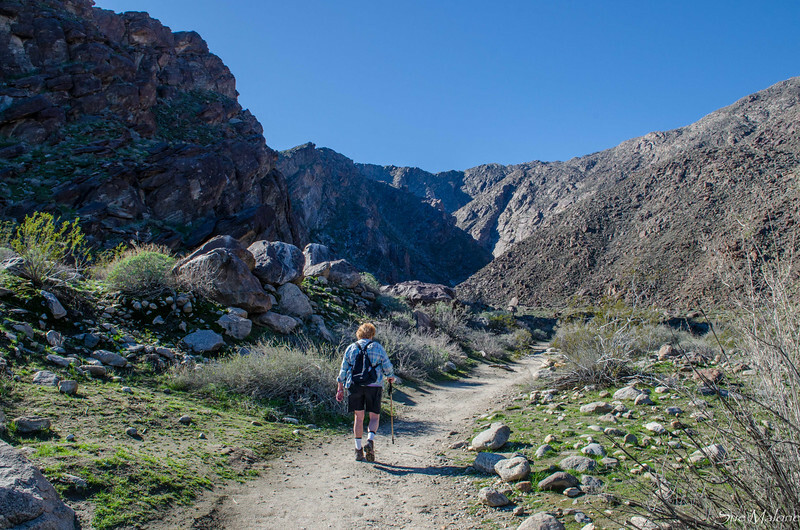 Our hike was a perfect finale to the 11 days we spent in the Coachella Valley, finally visiting a beautiful place that no one should miss when traveling to this area. We now have seen all ten places listed in the book, and yet there are many more trails to explore within each of those sites. I know we will come back. 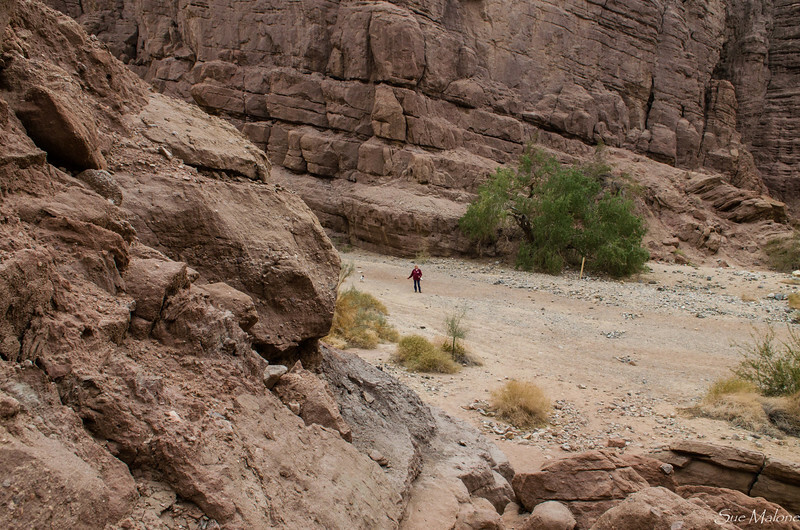 Whether for a day or a few, this valley is on our way to whatever desert we chose to explore. No matter the shifts and changes at Catalina Spa, I am reasonably certain we will park there again as well. Who knows what we will find the next time we come. I still miss the “lower” pool, and the bigger one in the upper park is a substitute. But it worked, I still was able to swim in the middle of the night or at sunrise, and had the pool to myself. That is still the best part of Catalina Spa for me. For Mattie, I think the dog park is fun, but the best part for her is the open desert to the north of the park, filled with debris from park cleanups, but also filled with rabbit smells and open space where she can run off leash a bit. Mo and I like walking out there as well, watching whatever lightshow appears for us on the distant mountains. I do feel incredibly lucky to have the chance to escape to the deserts, no matter how long or how short the trip may be. There was a time, as my daughter reminded me on the phone today, when February would put me in a dark place. I don’t take for granted the shifts in my life that allow me the freedom to roam, to wander, to swim at dawn or hike on a weekday, or sit in a fabulous movie theater on a rainy afternoon. Retirement really is incredible. Raining. Yes, at the moment it has been raining for several hours. I’m not complaining, the desert and the state of California needs rain in general. I am not complaining, because even with the rain, we have escaped the deep snows and epic cold that have gripped both our home town of Klamath Falls and our new home town to be, Grants Pass. I am not complaining, because in the midst of the rain storms and chilly weather, we have had a few nice sun breaks, and temperatures in the high 60’s. The photos from the last post when we hiked the Indian Canyons proved it. Yet, somehow, when the rain is coming down, it is easy to forget all that lovely sunshine that lasted for a day here and there. A day or so after we arrived, Mo put out the patio rug and the chairs, and on one lovely day actually sat in the chairs and read while I worked on photos and the blog. Nice day. The winds started up after that, and the rains once again so the rug got staked down and the chairs folded up and put under the rig to stay dry and not blow away. Winter in the desert. 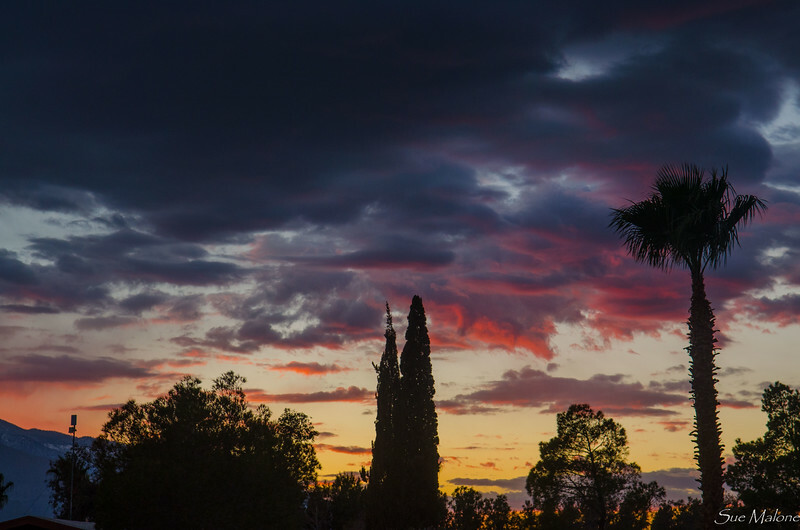 Not always, but often enough that if you plan to escape your cold winter climate, you need to be prepared for times like this, when the wind blows, the rains come, and the skies are gray. It happens. Yesterday the predictions were for 20 percent chance of rain, holding off till late afternoon. Taking advantage of that prediction, we headed east on Dillon Road all the way to Indio, and then toward Mecca and east to Box Canyon Road. 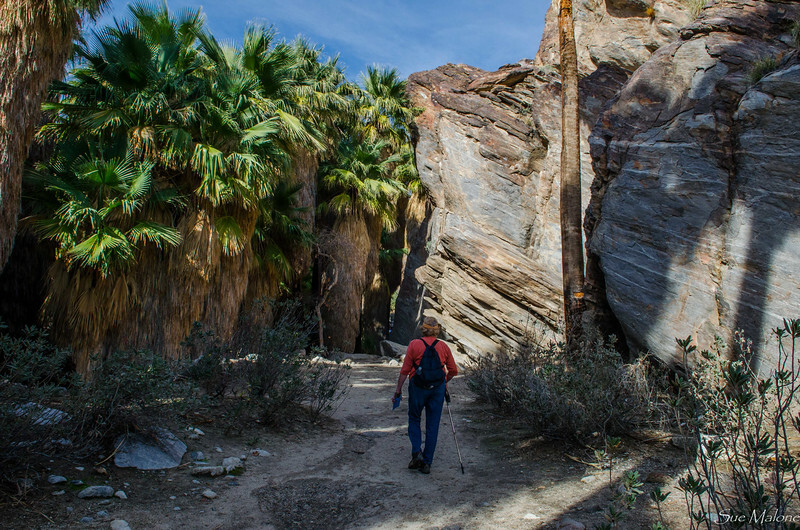 Al, of the Bayfield Bunch, has talked of Box Canyon Road many times on his blog, being their route of choice when they travel I-10 west from Quartzite heading for Anza Borrego. In fact, I am sure that several of the bloggers that I follow have talked about Painted Canyon, with some of you actually squeezing between the slot canyon walls of Ladder Canyon. 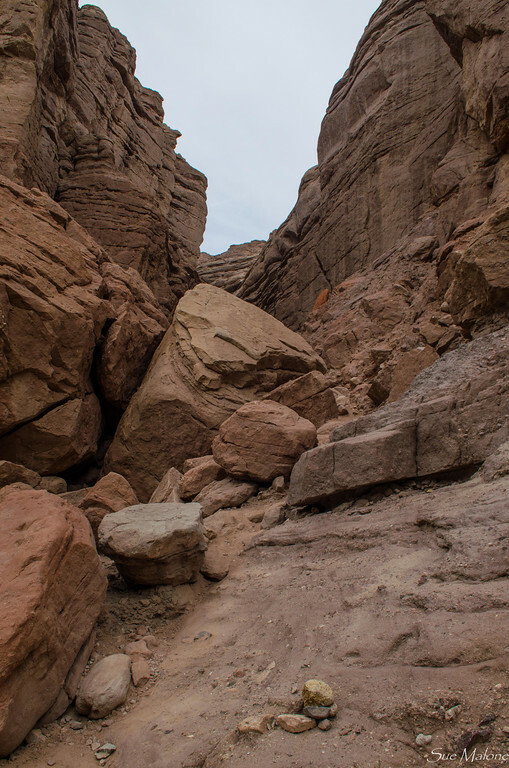 Maybe later I can look up your stories, but in the mean time, if you are reading, and you have hiked Ladder Canyon, pop a comment in here and let me know where to find your post about it? The skies were gray as we turned onto the graded dirt/gravel road that leads to the entrance of the lovely canyons that are within the wilderness area boundaries. 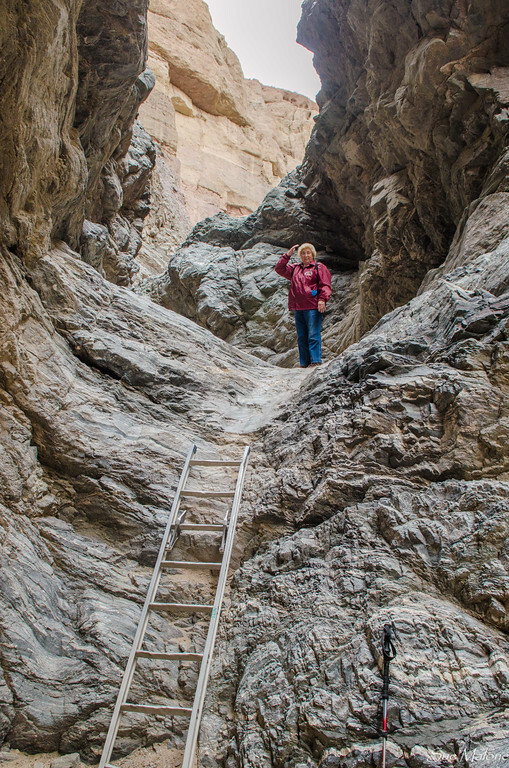 We knew we could take Mattie on the main canyon, but also knew that she wouldn’t be able to climb the ladders on the side canyon, appropriately called “Ladder Canyon”. We will save that one for another time, and maybe a time when I am a bit more narrow, so when I turn sideways I can still fit between the walls? 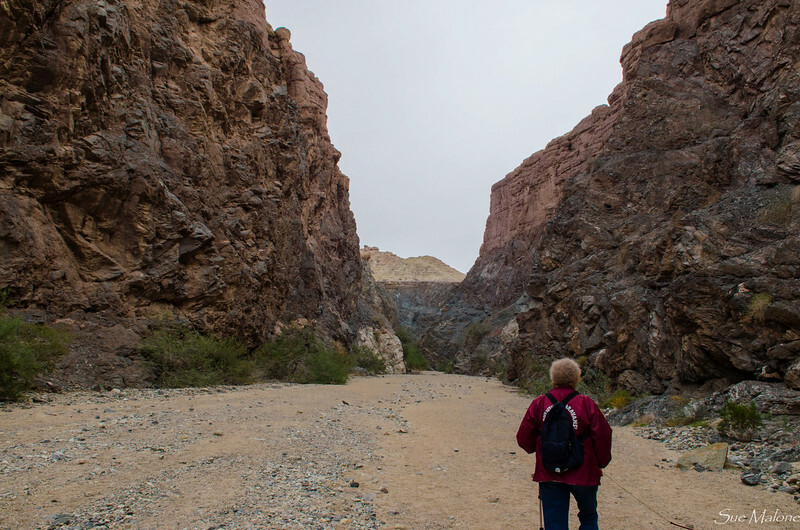 The main trail through Painted Canyon is wide and nearly level. I found the narrow and steep trail that leads into Ladder Canyon, and was glad that Mattie was along to give me an excuse to not try it on this day. Lots of rock climbing and scrambling involved in that one, and I needed to be in a different mood with a happier knee to do it. Next time. 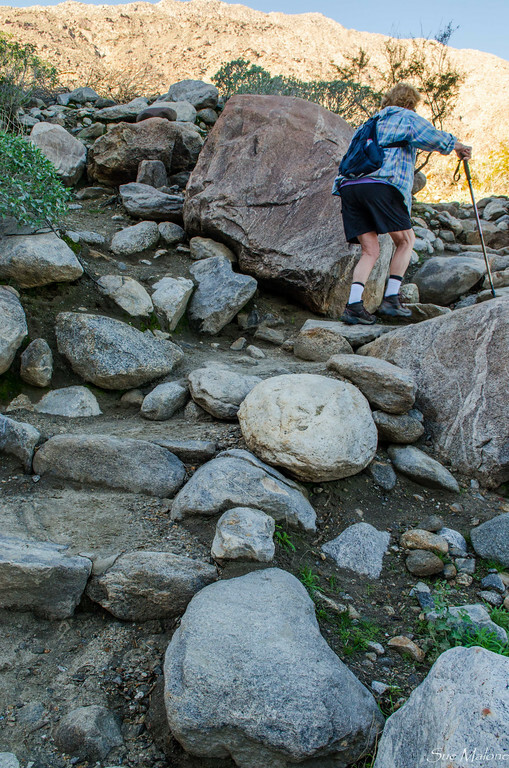 The trail to Ladder Canyon isn’t easily visible unless you are looking for it. 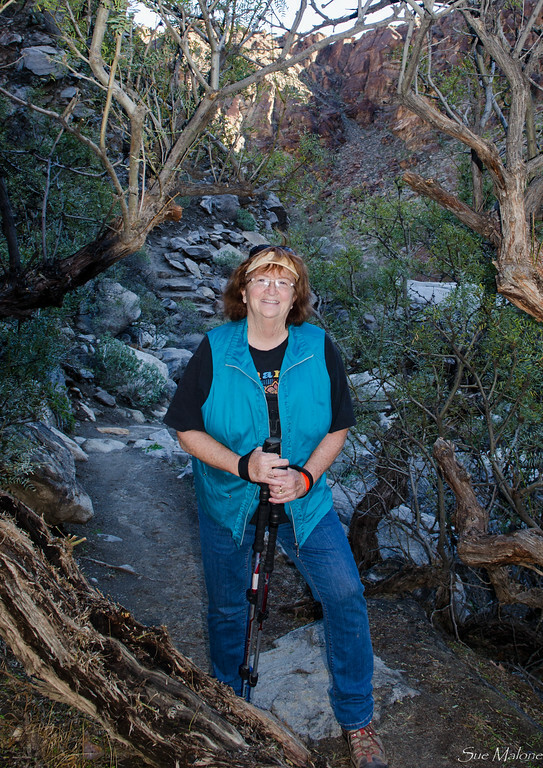 We walked the length of the main canyon, meeting a large hiking group and sharing the space with some young guys who somehow missed the Ladder Canyon trail. We saw four young lovely girls taking off that direction and when we told the guys how to get there and told them about the cute girls, they burst into a trot to get back to the “right” trail. 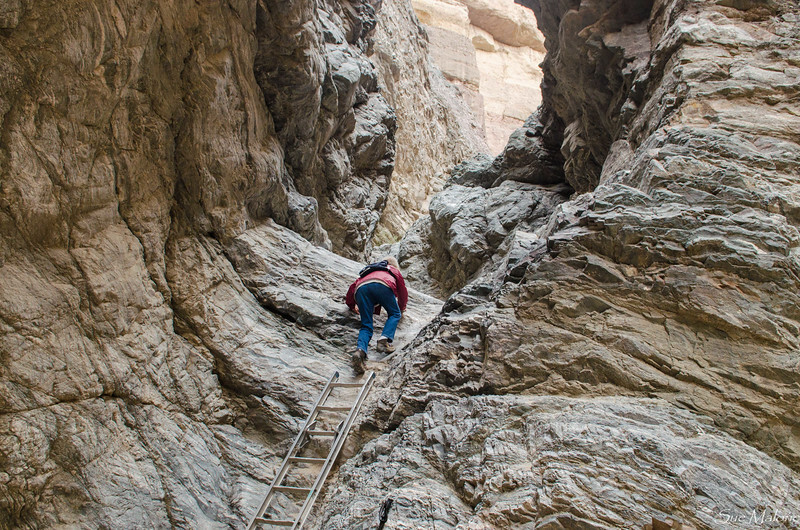 At the end of the main canyon, there is a large rock pour-over, graced by a couple of metal ladders leading up to the next level. Mattie, the rock climber, attempted to leap up those rocks, but couldn’t quite make it to the top. Instead, I stayed behind with her while Mo explored the ladders, hollering down from the top to me, “It gets level again up here!”. Well, neither of us was about to carry Mattie up those ladders, so again, we will save that one for another time as well. It is always nice to have something new to try for the next time, minus the dog, who thank goodness is willing to wait at home when we need her to do so. 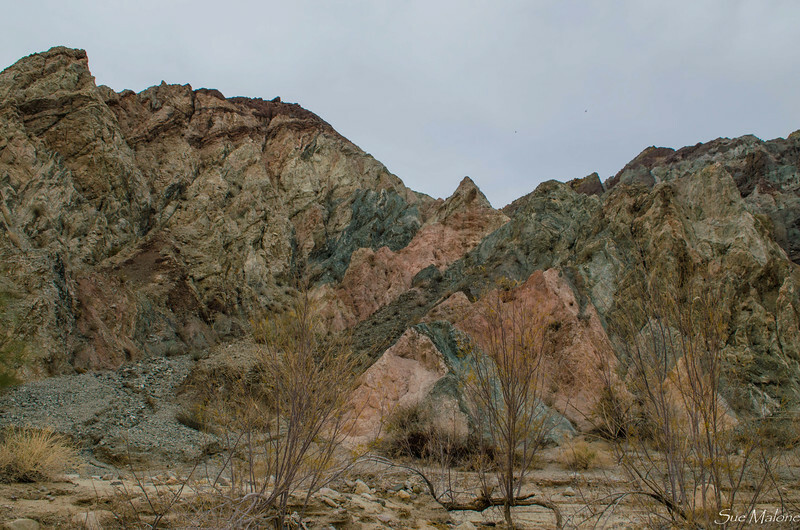 The colors of Painted Canyon were somewhat muted and subtle, partially because of the muted daylight and cloudy skies, and partly because they are a bit muted and subtle anyway. This canyon is not like the canyons in southern Utah, without the brilliant red orange sandstones of Navajo and Wingate. The drama comes in the contact zones, where the break between layered sediments and highly cooked metamorphic rock is incredible. 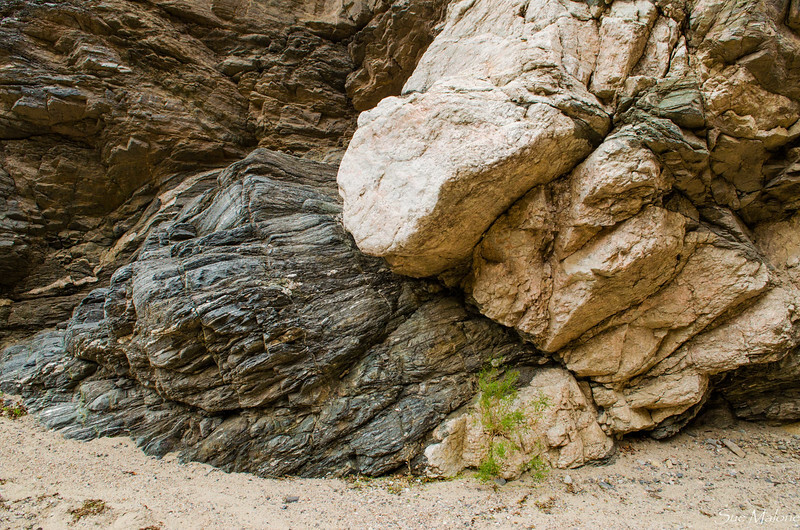 In this photo, that light zone at the top of the cliff is not a light difference, it is the contact between dark metamorphic and light sedimentary rocks. 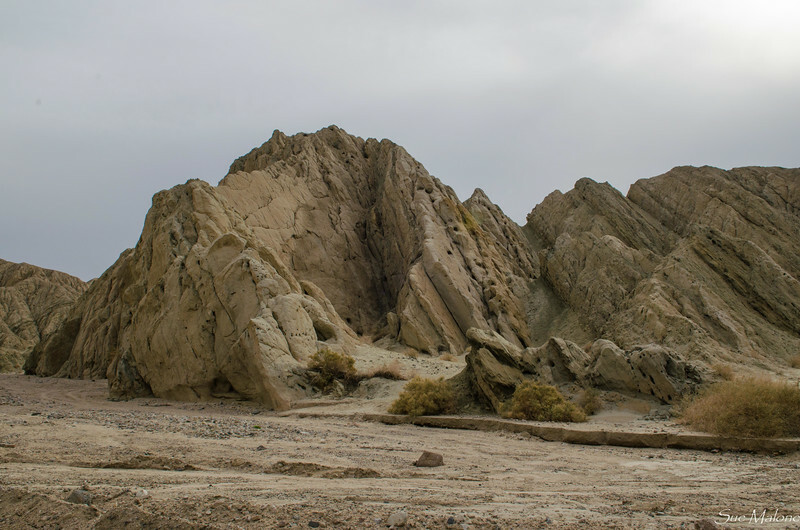 Here, in the Mecca Hills, the graded dirt road crosses the San Andreas Fault, and the vertical uplift of sediments that were once old lake and sea beds is dramatic, as are the contact zones between all the different kinds of rock, jumbled, cooked, and twisted by the forces of faulting and uplift. It is a geologist’s dream place to visit. Leaving the canyons, we drove back out to Box Canyon Road and turned north toward where it intersects with I-10 at the southern entrance to Joshua Tree National Park. 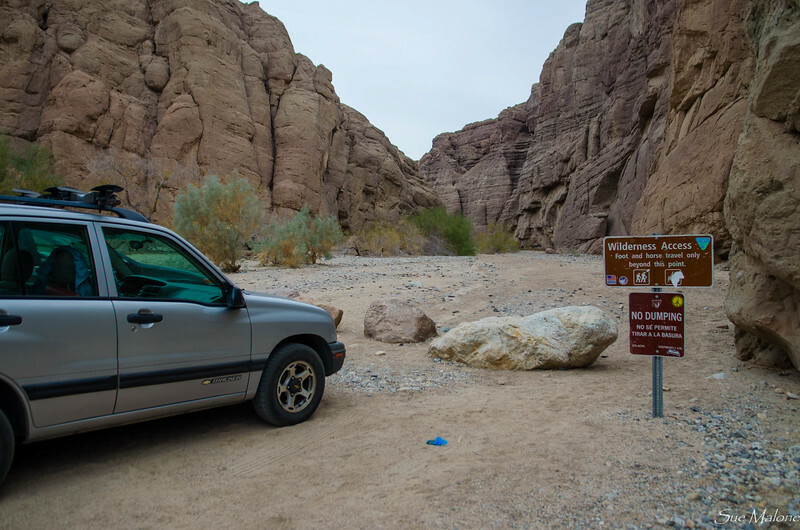 We boondocked near the entrance a few years ago, read about Box Canyon Road, and it has been on my list of places to explore for some time now. The canyon is interesting, winding and full of eroded sediments and soft rock that make for complexity and lots of sandy washes. 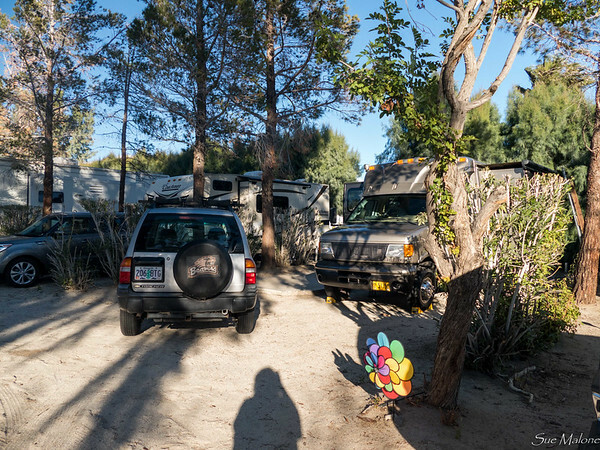 There are boondocking sites all along the canyon, and interesting side 4 wheel drive trails to explore. However the canyon walls enclose the views, and when in the desert, we prefer those long vistas that are such a part of boondocking in the desert. We might not choose to camp here, although we did see several folks settled in to nice spots. At the moment, we are under a wind advisory, nothing too serious, and nothing unusual for Desert Hot Springs at this time of year. The skies are wild and gorgeous, with huge puffy white clouds rolling over the mountains and making shadows on the desert floor. We are in shorts, with sun pouring in the windows of the rig, although it is hard to guess what the actual outside temperature might be if the wind weren’t blowing. Currently I have my favorite George Yates rib recipe on the Weber Q, packets of yams/apples/and onions ready for cooking when the ribs are done, and some cole slaw in the fridge. We are having company for supper, just a way to say thank you for lunch yesterday, which Claudia so delightfully offered after our hike in the desert. 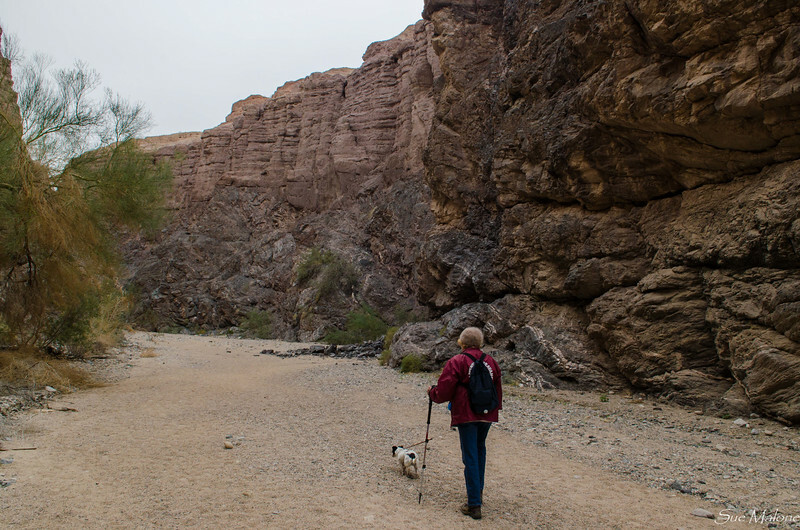 In all the years we have traveled to Desert Hot Springs, we haven’t managed to hike the Indian Canyons. There is a fee to enter and there are no dogs allowed. 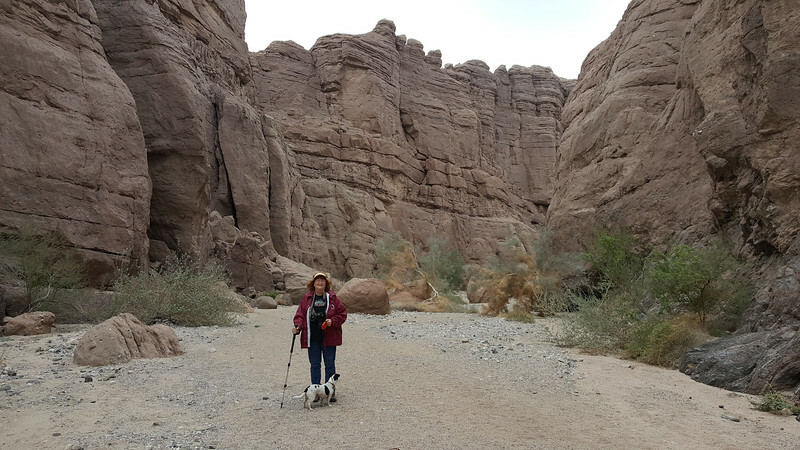 With so many places to hike, even some dog friendly ones, it didn't’ seem necessary. Yesterday we decided it was time to make the effort, and oh what a place it is! But first I have to share the other desert treasure we visited. 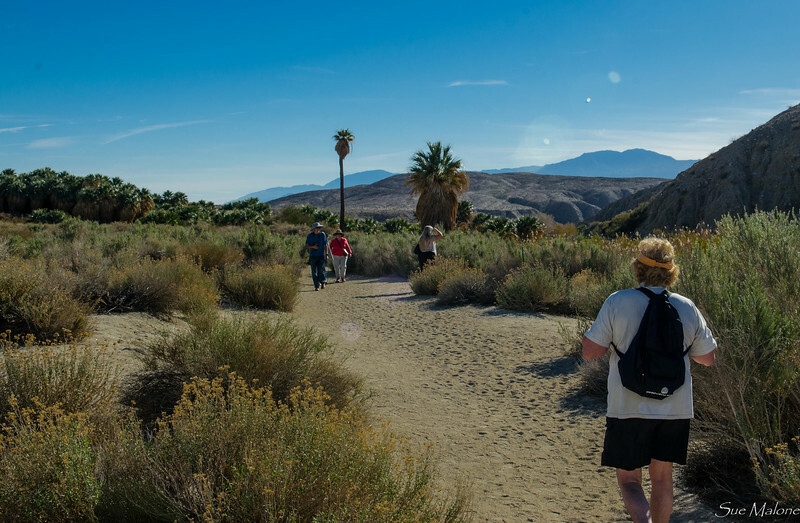 Thousand Palms Oasis in the Coachella Valley Preserve lies several miles east of the RV park. I first hiked here on Christmas Eve in 2010, where Laurie and Odel met me and shared the hike they loved. We had a great day, and I was thrilled by the beautiful palms. Mo and I have returned several times to hike here, sometimes simply walking around the groves, and other times wandering off into the desert, lost even with a GPS (and no phone signal). That was 2 years ago, and we did manage to find our way back to the visitor center without mishap. 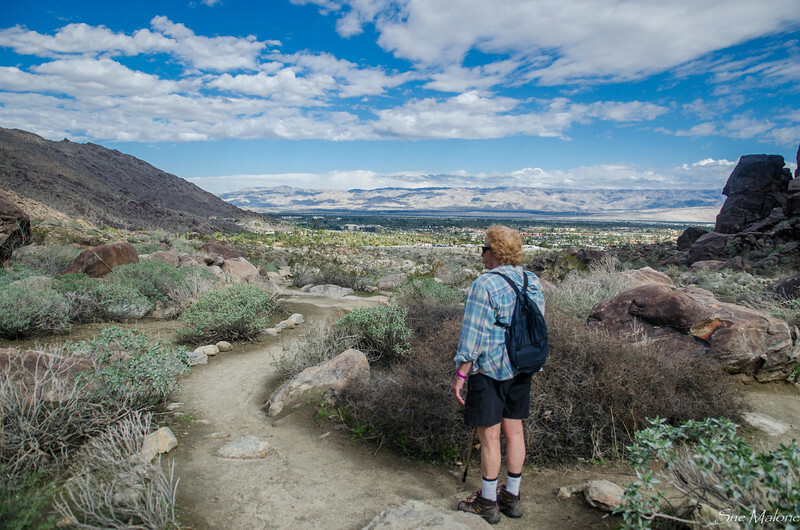 This year we decided on the shorter hike from the Visitor Center to Simone Pond, just a little over a mile, and an easy walk through the desert wash landscape. The ponds are home to an amazing array of wildlife, including the desert pupfish, birds, frogs, snakes, rabbits, and other critters. The docent at the Visitor Center reminded us that this area has been preserved in perpetuity for the sake of protecting the habitats, and if people abuse the area it is a simple matter to close the trails. The Oasis is not for people, but for habitat management, so protecting that habitat is the priority. The true treasure of Thousand Palms, however, are the palms. California fan palms, majestic in their size and unique nature, are the only native palm in California. 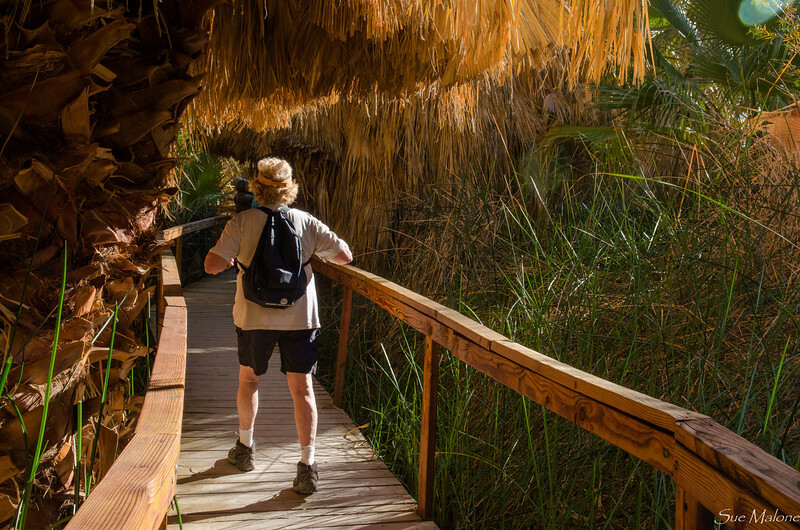 They occur in a few oases throughout this part of California, and while there are actually maybe a few hundred rather than a thousand in this particular oasis, the trails that meander through the wetlands are a wonderful way to experience the rich shadows and glorious light that fills the palm forest. We took our time, enjoying the trails and delighting in the brilliant, warm desert afternoon light. Being Sunday, there were quite a few people on the trail and the parking lot was nearly full. But no matter. Everyone was respectful, families were pleasant, with lots of laughter and welcome greetings along the trail. It was a lovely day. 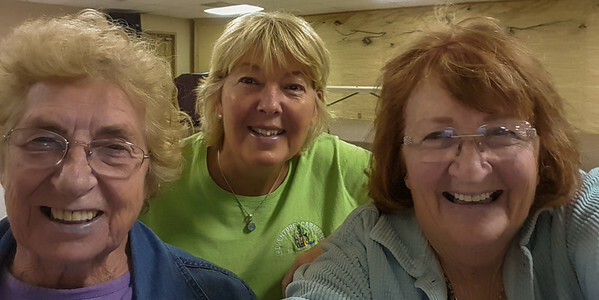 The predicted rains and winds showed up on Monday, and Mo and I decided to track down a couple of my favorite quilt shops before finding the Mary Pickford Theater in the heart of Cathedral City. Our destination was an afternoon matinee showing of “Manchester by the Sea”. 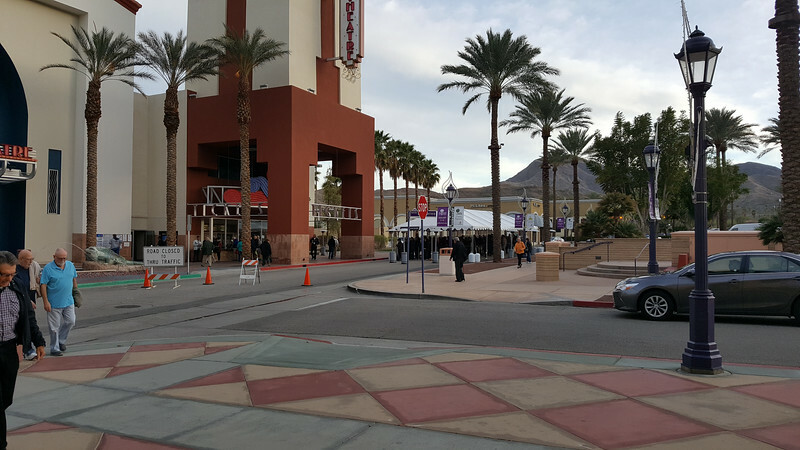 It was a bit surprising to find fairly long lines at 2 in the afternoon, but the Palm Spring International Film Festival is happening this week as well. The ticket seller warned us that the only seats left in our chosen theater were the first two rows. Ok then. When we walked into the theater, those first two rows looked like something out of a United Emirates Airline commercial. There were huge recliners, with cupholders and lots of space between pairs of seats. The movie was well done, definitely worth seeing, but the chairs very nearly overshadowed the movie experience with such comfort. Haven’t seen that before in our small town movie theaters. 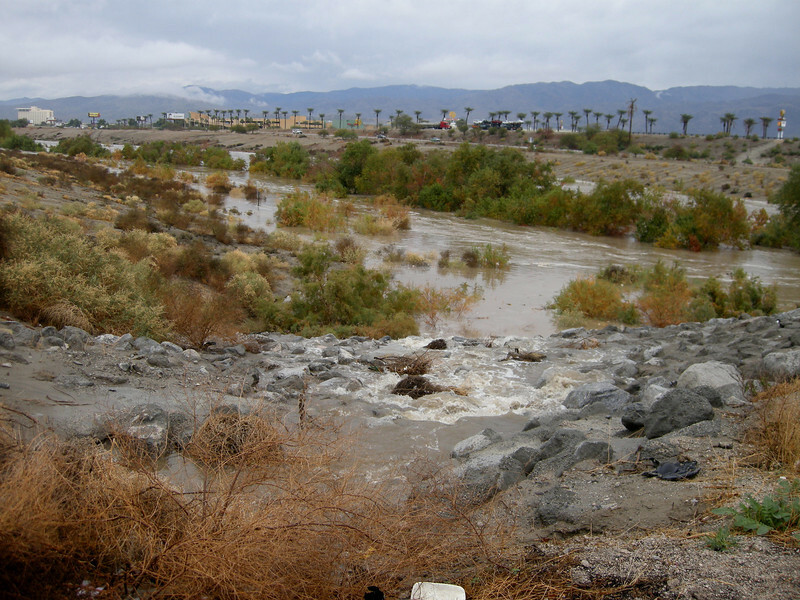 The next day, Tuesday, again had high wind predictions for Desert Hot Springs, with winds ranging from 25 to 35 mph with gusts to 55. As is often the case, however, the winds across the valley in Palm Springs were less than 5 to 10 mph, and the day was nice enough to go hiking without jackets. We debated shorts, but settled for long pants instead. Claudia isn’t familiar with the area, and when she found out we were going hiking, asked if she could tag along. 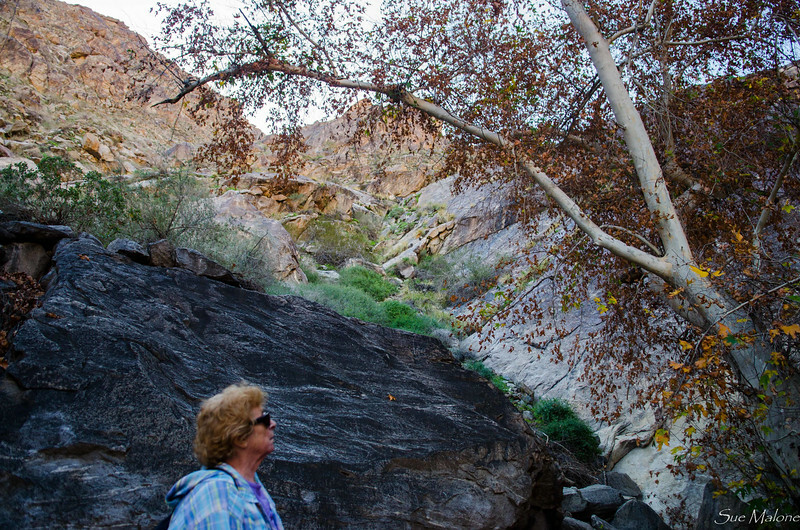 The Indian Canyons of the Agua Caliente Band of Cahuilla Indians are an incredible desert treasure. 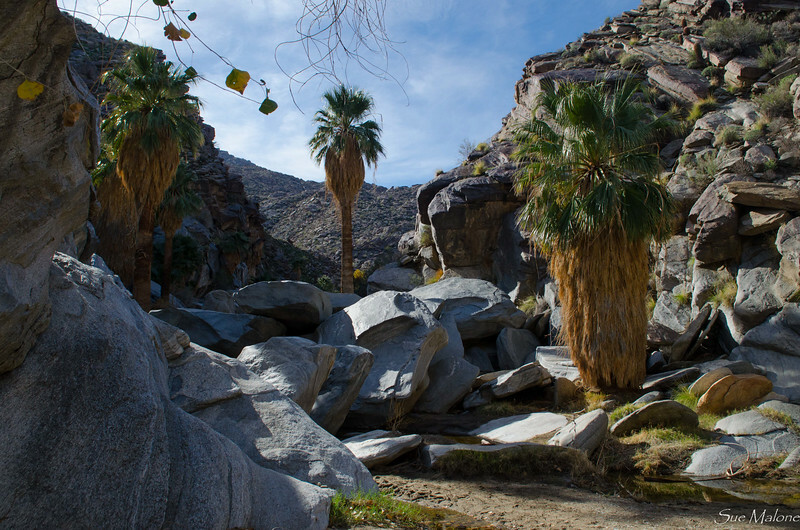 Cahuilla Indians have lived in these canyons for at least three thousand years, where they established villages, and tended the palms to increase fruit production. 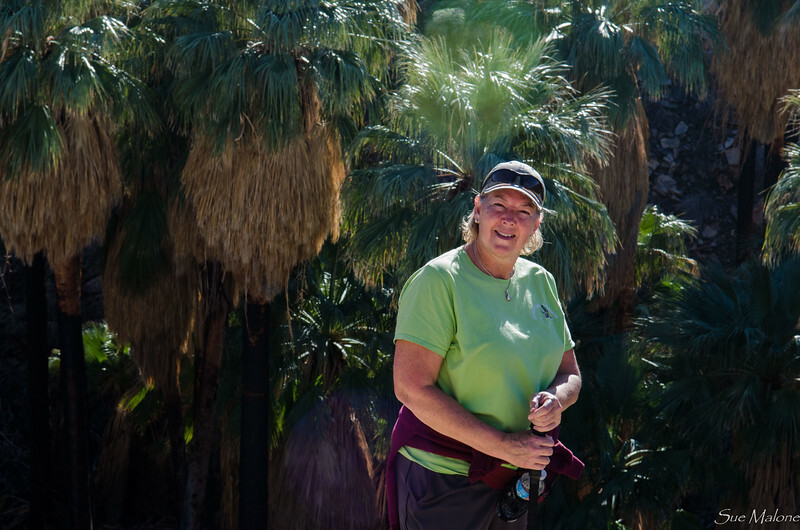 The canyons are an invaluable resource, providing year round fresh running water, palm fronds for building homes, fruits and seeds from palms, mesquite, and other plants to provide ample food, and protection from the harshness of the summer and winter climates. We first hiked up Andreas Canyon, enthralled by the light and shadow, and the sound of running water over huge granite boulders. There are mortars worn into the bedrock, formed from the grinding of palm and mesquite fruits, some of them as much as ten inches deep. 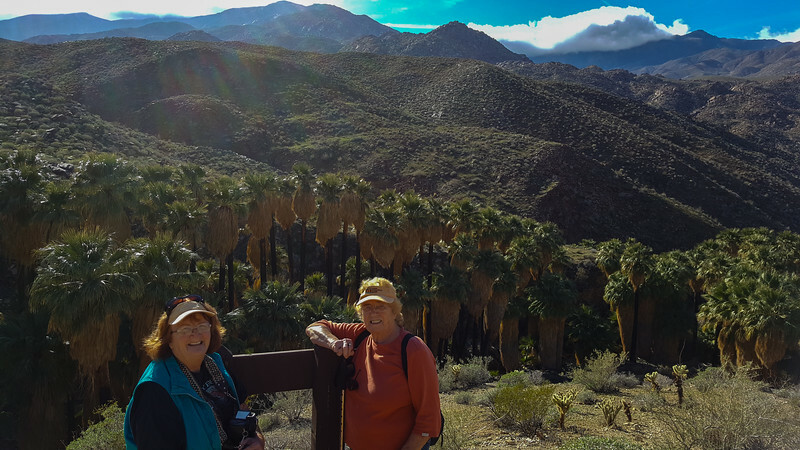 After completing the Andreas Canyon loop, we continued south on the main road toward the visitor center and the trailhead for Palm Canyon. 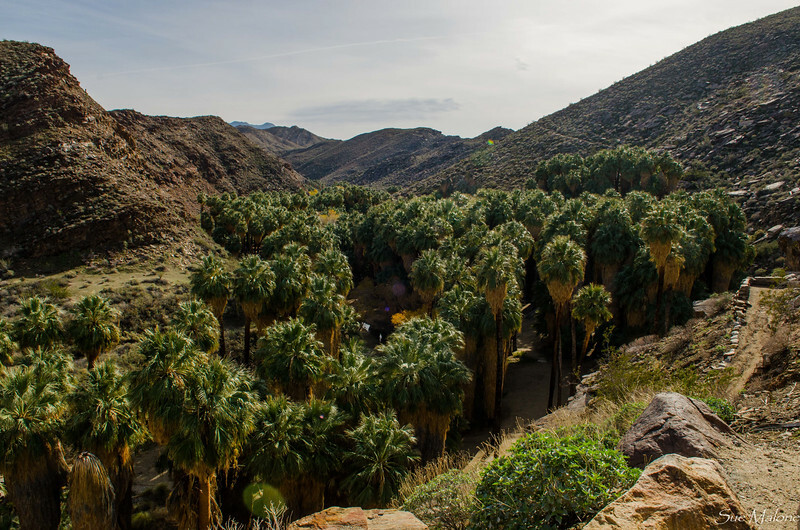 Hidden away in the wild badlands of this dry part of California are more than a hundred wild palm groves, and this is the largest, with a recent count of more than 2500 palms thriving along the canyon ravine. The stream is live with fresh water, the sounds of water and birds are the background to the rustling of palm fronds in the winds above us. 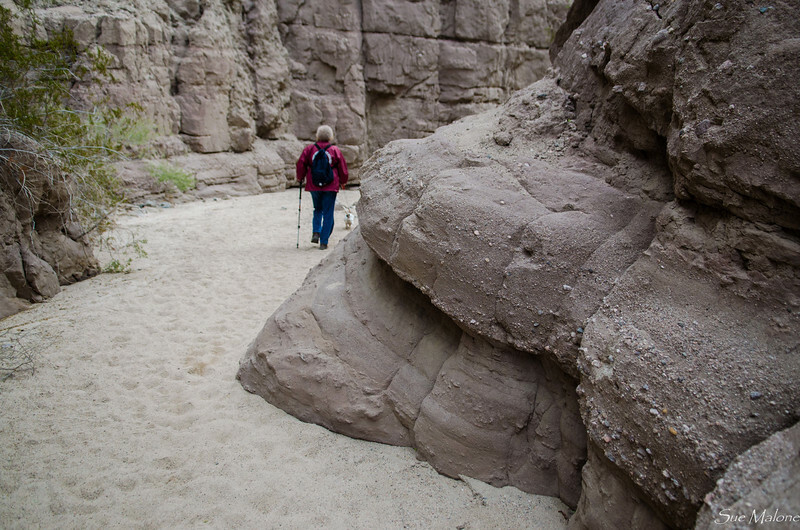 The floor of the canyon narrows and widens at intervals, and the trail is mostly level, wide, and soft. The fragrance of moist sand, decaying vegetation, and organic matter is pungent. 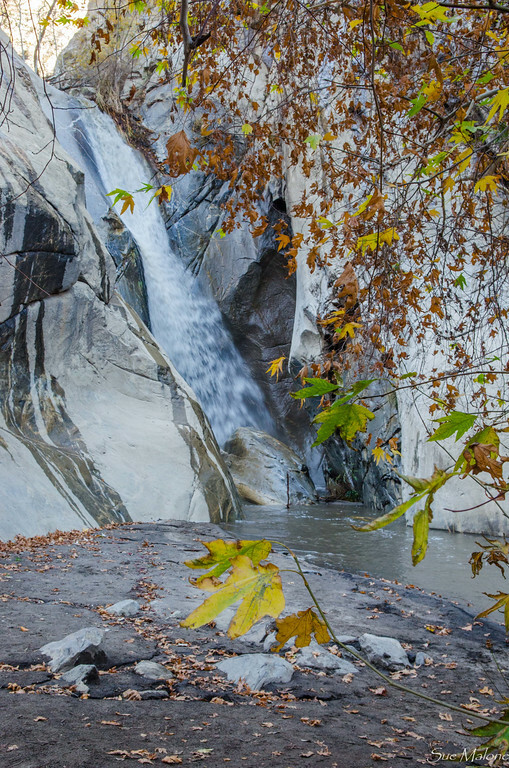 The ravine is 12 miles long, and separates the Santa Rosa from the San Jacinto mountains. 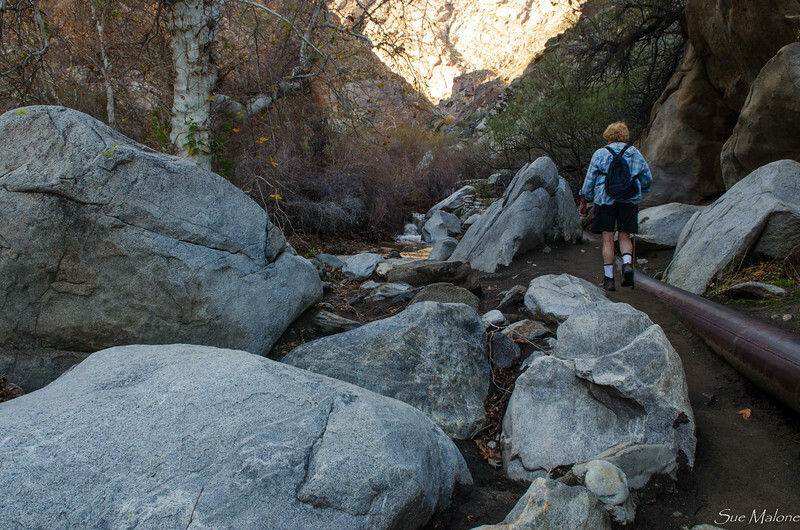 The trail climbs above the canyon in places and then meanders along old beaches and around huge boulders. It was one of the loveliest hikes we have ever experienced in all our years visiting this area, and there are so many trails to explore, you can be sure we will return again and again. 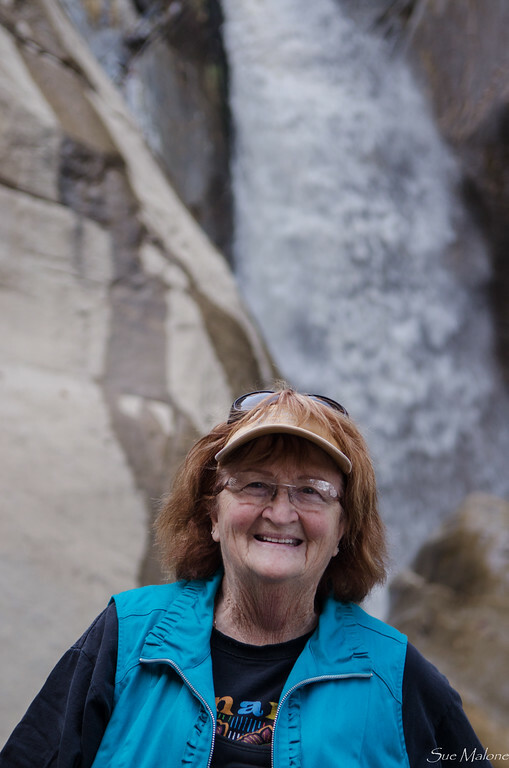 A nice benefit, the cost for seniors to enter the canyons is a mere $7.00, and with her military ID, Mo got in free. Wonderful. We only hiked a little over three miles, saving the six mile round trip hike to the Stone Pools for our next visit. It was nice spending hiking time with Claudia as well, and she wanted to treat us to lunch to thank us for showing her around the area. Of course, there is no better nor iconic Palm Springs lunch spot than Sherman’s Delicatessen. With a nice outside table, warmed by the propane heaters placed strategically about, we had classic Ruebens and a magnificent burger for Mo. Dessert is crazy at this place, not only famous for its Ruebens, but for its bakery. We left the restaurant with half our lunch in boxes, and more than half our desserts in other boxes. What a great day. Returning home to the rig found a happy little dog, who seemed to have spent the entire afternoon quietly chewing on her knuckle bone and waiting patiently. Lucky us! First, a little bit about Catalina Spa. Fellow bloggers who travel to this part of the desert sometimes enjoy time here. I am thinking of Betty Graffis, who we met here a couple of years ago, also of George and Suzie, who have enjoyed this park as well. Imagine my surprise when we drove in the familiar entrance, only to find the sweet little gate house empty, and the friendly guys who always welcomed us “home” nowhere in sight. We checked in on the 4th, after leaving the busy days of the rally behind. Friend Laura once again drove to the fairgrounds before we left and we had a great lunch at Walter’s in LaVerne. It is nice to actually see her in person, for Mo to meet her, and for Mattie to get more pets from the person who went to great effort to make sure she was well cared for while we were gallivanting around during the Rally. It was nice to thank Laura in person. As we approached Catalina, I was having visions of warming up my chilly body in my favorite whirlpool tub in the world. Uh Oh. It was a bit of a shock to continue down the main entrance road to find this. The gate is still there, but the new management doesn’t feel the need to have anyone guarding it. Better be sure you remember your gate code, as it is closed all the time now. Catalina Spa was sold to a new owner and he has big plans for turning it into a 5 star resort, beginning with gutting the old game room, store, showers, and spa area. There are a lot of 5 star resorts around, they are a dime a dozen, and I find them quite boring. Catalina is a bit funky, or at least it was. The now gated pool was open all night, and was an adults only pool. The spa was just steps away from where we like to camp in the 30 amp area, and my favorite thing was to walk there in the dark and slip into the pool at 4am, swimming and soaking while watching the stars and waiting for the sunrise. It is a good indicator of my age that I discovered I am NOT very flexible. I was furious, and frustrated, and especially angry that no one had mentioned a word of this when we made our reservation last fall. 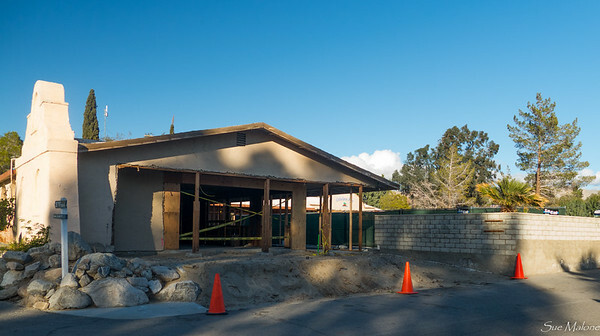 The office building is gutted as well, and rumor has it that what we call “the lower park”, with 30 amp service, sites that are much less than level, and old trees to provide desert shade, will become an area of park model rentals and permanent homes. Yeah, sure, the big pool in the upper park is still open, with its spa and game room available. I would avoid that pool, and think in all the years we came here, only swam there a time or too. You know…stuff like teenagers courting by jumping on each other and splashing isn’t really conducive to a relaxing swim. It isn’t quite the same to walk the distance in the dark, or jumping into the car to go swimming. We are here. We are enjoying our site adjacent to the dog park, as is Mattie. We have been swimming, so far just in the evening, with the aforementioned teenagers, and all the busy-ness that is part of the upper clubhouse, aka people. The hot tub is a lot smaller, and more full, at least when it is usable. So far that has been only once, when the rest of the time the temperature is hot enough to actually scald a tentative foot used to test the waters. Ah well. Only thing in life that is sure is change, but I sure don’t like it. I guess other people have a bit of the same idea, at least the ones who are not here. The park is about half empty. 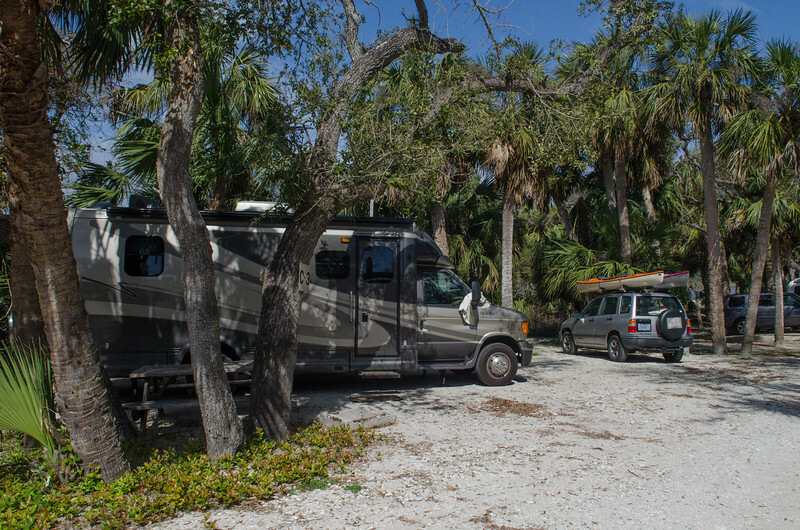 Without knowing about the changes, we recommended Catalina highly to our new friend Claudia, co-owner of Adventure Caravans, and she is staying here as well. With a big rig parked right next to the upper clubhouse and a great view over the desert, I think she is enjoying herself. With a personality as big as Texas, Claudia loves people, and can talk to anyone. Our first night here she invited us to join her at the clubhouse for one of the dinners. It was interesting, and we had a great time with Claudia, but we probably don’t have to try the clubhouse dinner again. Even though we are 90 minutes farther east than we were at the fairgrounds, Mo and I decided long ago that on this trip we would travel back to Pasadena for something special to us. Friday morning, with the predicted rains expected to hit on Saturday, we drove back west. We were blessed with gorgeous skies, views of the mountains to the north and light traffic on the 210 for the entire distance. Our destination was the Pasadena Museum of History. As most family and friends are aware, we are building a house at the cottage property this year, and while it won’t be a completely traditional Craftsman house, we hope to incorporate some of the elements of style that make Craftsman homes so welcoming. The history of the Arts and Crafts movement in America is fascinating, with several names that stand out. William Morris, creator of designs that were rich with floral motifs, Greene and Green, architects famous for their Craftsman style homes, and another name not quite as familiar to many, Batchelder. Ernest A Batchelder was a tilemaker who settled in the Pasadena area in the early part of the 20th century. His style is unique, and his fireplace and fountain installations are well known throughout the Los Angeles area especially, but occur all over the United States. 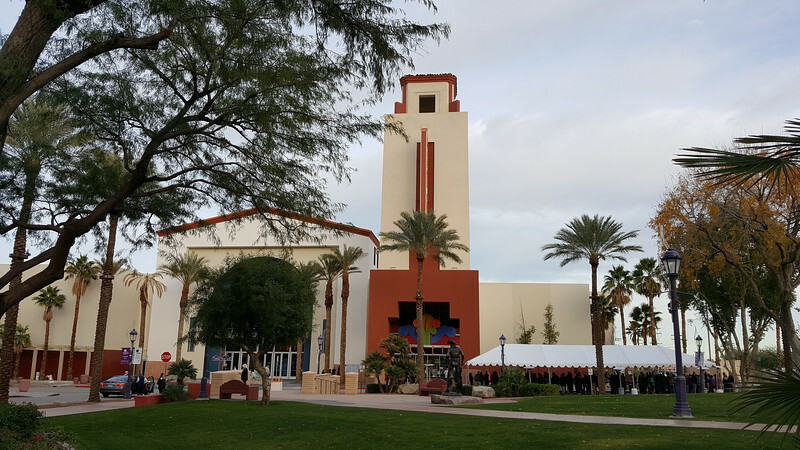 We were thrilled to discover that the Pasadena Museum of History has a special exhibit scheduled while we are in Southern California, and we weren’t about to miss it. We do have an extra special interest in the exhibit and Batchelder installations because Mo has been hauling around crates of antique un-set Batchelder tiles for a couple of decades. She installed a few of them in her house and in the cabin in Rocky Point. (The new owners had no idea what they had there, so we left a bit of literature for them). Our plan is to use the tiles in the new house, including the fireplace. As we entered the exhibit, both of us were tickled pink and very excited to be there, and to see our tile guy so honored. The show was small but beautifully done. One of the largest installations of Batchelder tile is the now closed Dutch Chocolate Shop in downtown Los Angeles. It is inaccessible to the public, except for special tours, and we have never managed to get here at the right time to participate. An especially delightful exhibit at the show was a simple chair in a small alcove and a virtual reality headset. Mo and I put on that headset and walked all around the interior of the chocolate shop. There was also a visit to the interior of Batchelder’s home and gardens, now owned by Robert Winter who donated tiles and curated the exhibit. We loved seeing several of our tiles on display, especially the “City of Hearthside Dreams”, a 12x12 tile which will be the center feature of our fireplace. I have always wanted to visit the Gamble House, another Pasadena Arts and Crafts site, and had no idea that the location was just a couple of blocks away from where we were at the Museum of History. Our timing was perfect, and we snagged tickets for the last docent led tour of the day through the house. The architects Greene and Greene were highlighted in a special exhibit that we saw last week at the Huntington, and it was exciting to enter the house for which they are most famous. The artistry of this home is magnificent, with the connection to natural materials, and the simple ethic of the Arts and Crafts movement so well used. Arts and Crafts style was a move away from the doo dad complexity of the Victorian style that was so popular during the late 19th century. The tour was fascinating, and as is often the case, we were not allowed to take photos of the interior. I am sure they want to sell the expensive books that are in the lovely bookstore! Here is a link to a ton of images from the web of the exterior and interior of the house. What we discovered was that no matter how impressive and wonderful the Arts and Crafts style can be, it is often quite dark. The interior of the house was incredibly dark, and reminded us why we are going to go much lighter in the house that we build. Light!! Need Light!! Southern California is a haven for old Arts and Crafts homes, from simple bungalows to huge mansions like the Gamble House. We once again drove the streets of Pasadena’s Bungalow Heaven, only this time we had a different thought in mind. Instead of simply looking for cute houses, we wanted to check out the stone veneers that grace so many of these homes. Our new home will have stone veneer, but we want it to look like this, not like the brightly colored big fake stones that we see around Grants Pass. Who knows if there is anything like the real thing around our part of the world that isn’t cost prohibitive. I was born in Sierra Madre, where my grandmother bought a piece of property in the upper reaches of Sierra Madre Canyon. 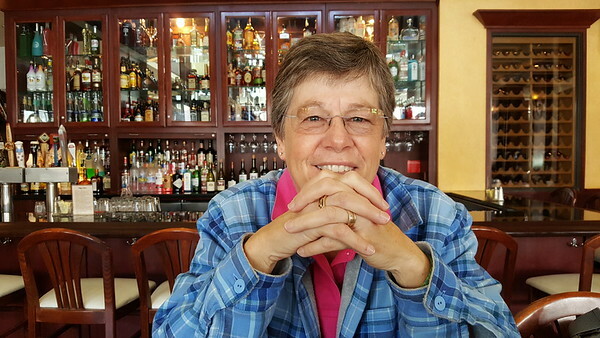 It is an eclectic place, and has been so ever since 1929 when she bought the property. She left in the mid 70’s, and her own home high on the hill burned in 1980, but she owned the lots and the second house that was lower on the hill until close to her death in 1993. I lived in this little house in 1962 and 63 and my husband and I brought our first born daughter Deborah up these steps in January of 1963. The steps are almost gone now, and I had to hunt to find them. One year Mo took me to visit her roots at the family home in North Dakota, and again in Columbia City, Oregon, where she grew up. Both homes were traditional bungalows, lovely and solid, much like Mo. It was interesting to compare our roots, to think about how the people who were influential in our lives affected how we turned out. 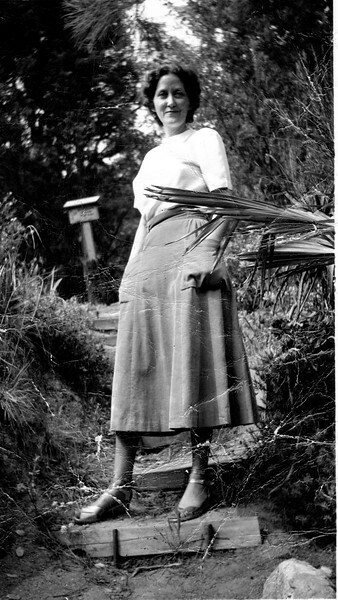 Here is a photo of my grandmother in 1955 at the lower end of her steps. I keep saying I have a reason for my somewhat off the wall history, I can blame it on my eccentric grandmother who lived this canyon, drove this road in her 1937 black Buick, and climbed the stairs to her tiny house, so small the fridge had to be kept on the porch, for almost 5 decades. Mo and I drove around Sierra Madre, enjoying the old rock walls and home facades that are such a part of this town. 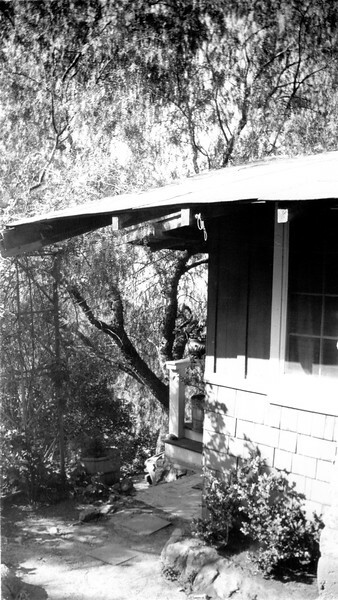 I realized that the reason I am so attached to the idea of rock facing and bungalow style might have to do with my roots so long ago in Sierra Madre. 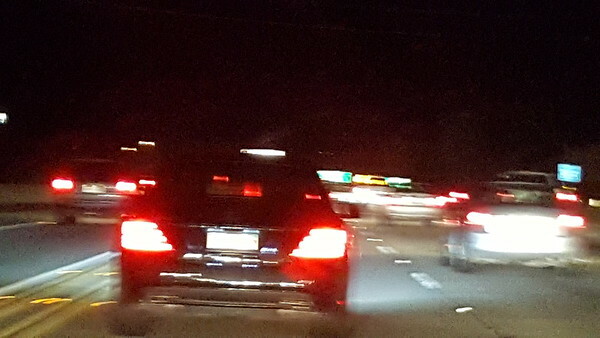 Our return trip was later than we expected, with the extra time we took to tour the Gamble House, and traffic was as it often is on the freeway. We ambled along Huntington Drive instead, with evening approaching and traffic so heavy, decided it was time to find food. A quick check of “Chinese Food Nearby” on google maps yielded a restaurant just minutes from where we were. We settled in for a great meal at Youngs, with orange chicken done right with lots of real orange and red peppers, crispy and perfect, and Mandarin beef, spicy enough and tender. Daughter Melody always said never eat Chinese food in a town of less than 50,000. I think Duarte has fewer people than that in the actual city limits, but as LA people know, all these cities run together and the Chinese restaurants are great. Anything from current Asian fusion, to the more traditional “Chinese” that is like comfort food is available, and the traditional big aquarium was the perfect finishing touch. Back on the 10, the traffic was pretty slow all the way east until we were almost to Palm Springs, but we didn’t mind. The day was so fulfilling the drive didn’t matter in the least.